The powerful Colorado River sculpts the Canyonlands. Far below, the muddy Colorado winds through the gorges. Ancient layers of sedimentary rock form the Canyonlands. Amidst the parched desert soil, a cactus flower blooms. Canyons...where "Thelma and Louise" flew skyward in their car. For millions of years the mighty Colorado River has been power-washing it's way through ancient mountains of rock, sculpting them into magnificent gorges and canyons and mesas, buttes and plateaus. It is mind-boggling to see the impact from the sheer force of the brawny Colorado. Millions of visitors have witnessed the majestic artistry of the Grand Canyon, carved out long ago by the herculean Colorado River. Yet this river has also etched out thousands of other world class canyons throughout the western United States...many of which are just as spectacular in their own way as the Grand Canyon yet remain unexplored by countless travelers. 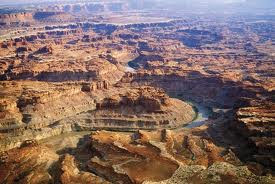 Canyonlands National Park, just outside of Moab, Utah, is another geologic wonder chiselled out by the Colorado River. There are three distinct sections of Canyonlands but one called "Island in the Sky" is most accessible to general car traffic. On the day we were there, it was not crowded. We drove across this wide, high plateau and were rewarded with expansive vistas of deep red rock canyons in all directions. In the far distance, we could see a large mountain range still snow-covered on top. Unlike Arches National Park where we thought we'd die of heat prostration, Canyonlands was slightly cooler and seemed to have an entirely different eco system. Flowers, meadows and prairie grass covered some of the landscape whereas at Arches we saw no flowers or greenery. At Canyonlands, you can get out of your car at numerous scenic overlooks and hike down to the rim of the canyons. Very scary, but the deep gorges and canyon views are stupendous. We had a picnic lunch not far from the rim edge, overlooking 100 miles of vast landscapes of red rocks, sheer cliffs and seemingly bottomless canyons. Several thousand feet below us at the very bottom, was the Colorado River...rushing swiftly through the gorges on its way to the Grand Canyon and beyond. Canyonlands has such lovely colors. I took a rafting trip through the canyonlands. I recognize that first picture. We pulled over and half of us hiked up and over that peninsula and met up with the raft after it went around the bend. What an awesome trip you guys are having! Wonderful photos of the canyon lands. The flowering cactus coincidentally the same as one which is flowering in a neighbor's front yard. Their yard is made up of all kinds of cacti and succulents. I've been blessed to visit the Grand Canyon north/south rim and the wonderful skywalk, but haven't made it to these yet, but I'm sure to go this fall, I hope! WOW what beauty and fantastic photo's. I love these canyonlands! !